For almost 10,000 years, the people on the intriguing island of Milos have been close to Nature. They have been devastated by earthquakes, volcanoes, tidal waves, poisonous gas, subsidence, sea level rise and famines induced by the impacting of comets elsewhere on Earth. 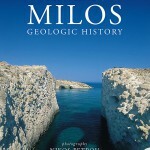 This book is the story of the unique place of Milos on Earth and how the Miloan people have recovered from these natural catastrophes by trading the minerals and rocks from their island.